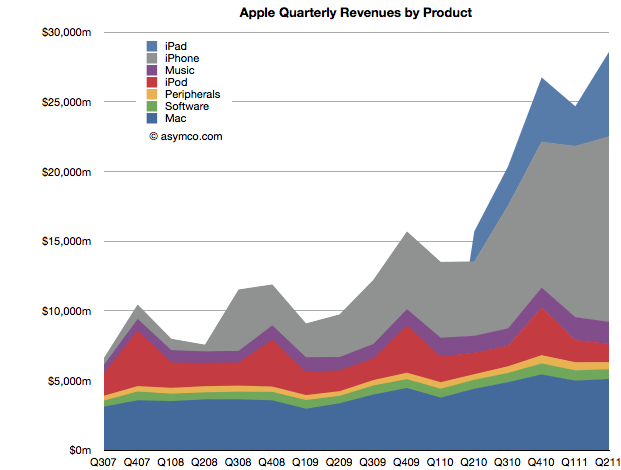 I’ve been providing analysis of Apple’s operating and financial performance for some time. Recently we’ve begun to look at comparisons of financial performance for comparable companies. Now it’s time to dig deeper and do comparisons of operating performance as well. Whereas Apple has product lines (iPhone, iPad, iPod, Mac, iTunes, Peripherals and Software), Microsoft has business divisions (Windows & Windows Live, Server and Tools, Online Services, Business (Office), Entertainment and Devices). 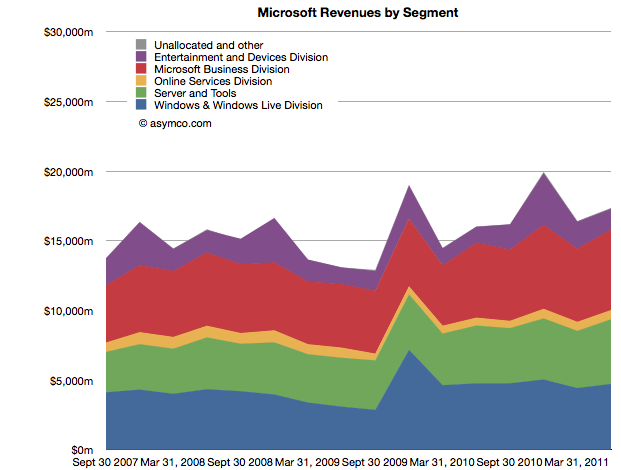 The charts show revenues for both Apple and Microsoft according to these defined segments. Note that the horizontal and vertical axes are the same. The period of coverage is from mid-2007 to the end of June 2011 which corresponds to the life of the iPhone. The vertical axis ranges up to $30 billion/quarter in both charts. When shown this way, the exceptional growth for Apple becomes easier to understand (and perhaps Apple’s valuation premium of 15.7 P/E vs. Microsoft’s 9.5). Microsoft has been growing these past four years but not nearly at the rate of Apple. Microsoft grew quarterly revenues from the ~$15b range to ~$17b range. The release of Windows 7 had a marked effect on revenues in the launch quarter but the sales did not seem to grow above the previous version’s run rate ($4.2b/quarter vs. $4.7b/q on average). But most importantly, whereas Apple’s growth has come from new businesses (iPhone and iPad), Microsoft has organically grown existing businesses. 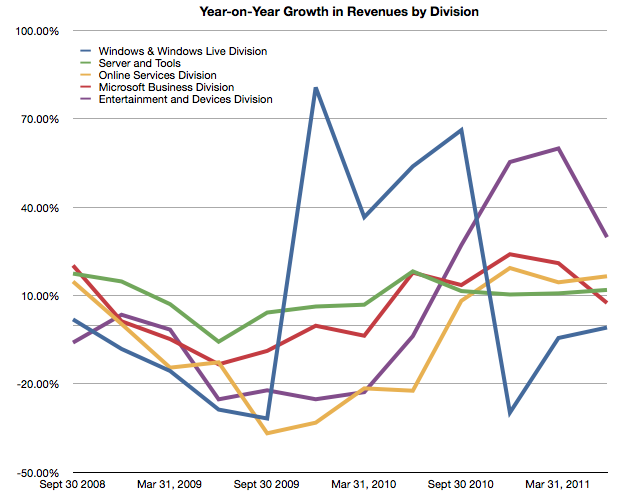 The condemnation of leadership at Microsoft should hinge on the absence of significant top line growth. Note that neither the Online Services nor the Entertainment and Devices divisions had appreciable net growth.